Carol Morrison’s new home in Tranquility Rise, Howick couldn’t help but be a winner. For a start, she has years of experience in the building industry and, as the specifier for Ashton Marsh for six years, she is constantly helping clients create their dream homes. However, when it came her turn to build, she had some pretty clear ideas of the form her dwelling would take. Jo Hitchcock from locally-based HArchitecture then entered the equation (the pair had worked together previously), and the collaboration was bound to turn heads. It did, securing Jo an Architectural Designers of New Zealand Finalist Award for First Time Entrant as well as a Finalist Award in the Residential New Home over 250m2 category. From the outset, the aim was to achieve the best design possible from the space available. Jo was to work with a 3.5m diagonal fall across the 600 m2 site, plus answer the brief for a home that related to the land on one level. Categorised as Heritage Zone 7, there had to be 6m of land set back, front and rear, with 2.4m on one side and 1.2m on the other. Responding to Carol’s request for “light, light, light” and husband Graham’s desire for the master bedroom be on the same level as the living spaces, Jo definitely responded to the brief, with one of the best features of the home being its intelligent use of space. The bach ethos starts at the front door where there’s a knocker instead of a doorbell. Five 2.5m wide wooden steps lead to the living areas, past the media room on the right – an intimate space with a gas fire and wide screen television, keeping noise levels down in the upper living areas. The ceilings soar wherever possible – 3.7m at their highest – and where there has to be a flat ceiling, the height is still generous at 2.7m. A lack of hallways also adds to the open feel of the plan. “But where we had to have a hall, we pushed the area out so it feels more like a space than a corridor,” says Jo. What’s intriguing is the lack of trade-off between the large spaces and those tucked behind the scenes, because everything is generously proportioned including en suites and wardrobes. Even the linen cupboard under the stairs would hold Harry Potter plus all his friends. Stairs leading towards the living spaces from the garage and front door create the platform that connects the house to the north-facing aspect. A further stairway leads to the “teen zone” where the lucky young resident has her own spacious bedroom, bathroom and private lounge. This area faces the street and privacy is assured with two horizontal windows, also chosen for balancing the design’s verticality. The couple is delighted with the way the house presents to the street, something that obviously impressed the ADNZ judges too. Carol also loves the kitchen – a space she thinks should dominate every casual living area. Not keen on minimalism and a great fan of cooking and entertaining, working behind the scenes in a scullery wouldn’t do for her at all. A large granite-covered island bar – 1.1m x 2.8m – is surrounded by a generous walkway between the island and benches. In many kitchens, this space is 1200mm, but Jo managed to tweak an extra 200mm. With three people in the household often cooking different meals at the same time, room to move was important and this space was definitely designed to meet the clients’ needs. To ensure an easy flow, the same colours and materials – white cabinetry and black granite tops – were specified for both the kitchen and bathrooms. Polished porcelain tiles at 600mm2 provide simple sophistication in the bathrooms, with a solid timber overlay floor in the kitchen and living areas. Most items in the home have been collected over the years and some favourite pieces have been transformed to give them a new look, such as the rimu dining table recently painted black. The clean lines of the contemporary furniture are balanced with the casual effect of wicker chairs and warm tones come from the exquisite Persian rugs and the collection of original artworks. Soaring ceilings demand dramatic effects and Carol enjoys collecting foliage from her immediate environment to create original arrangements which she places in large vases. There’s an abundance of ambience waiting in the wings too, with lamps and candles everywhere. The most eye-catching piece is a chandelier, hand-painted by Carol. It shimmers expectantly over the table, just waiting for the party to begin. Outside, the north-facing loggia and courtyard forms a sheltered sun-trap designed for outdoor living. Repeating the colour of the exterior, the retaining walls have been painted black, with griselinias forming a lush, native hedge. Flax grows in pots, and cabbage trees are firmly taking hold – all essential plants for any self-respecting Kiwi bach. 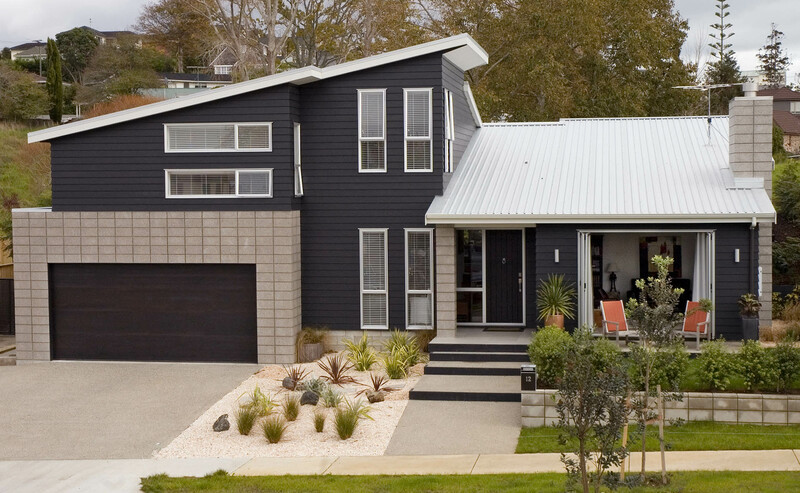 Although this is a classy interpretation of a casual Kiwi dwelling, the goal of relaxed, quality living has certainly been exceeded, which was exactly the intention. to say that I’ve really enjoyеd surfіng around yoᥙr blog posts.